I wouldn’t want to live in Scotland with a pain that doesn’t go away. On the BBC news a few nights ago bbcnews scotland it was reported that the wait to see someone who might be able to help could be 110 weeks in some regions , with an average wait of 30 weeks to see someone who knows something about pain. It is fundamental neuroscience that if the brain has worked out that pain is the best thing to produce to cope then if offered no alternatives, it will keep getting better and better at producing pain, so good in fact that most stimuli default to a pain production. The pity is that inexpensive, appropriate early education and behavioural change is likely to limit the number of Scots with chronic pain (now over 800,000). 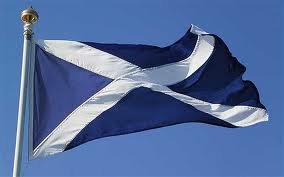 I am raising a flag to the Scots in the hope that something can be done about this tragedy. “Most stimuli eventually default to pain production” ………. So true and so simple to change with a little knowledge…….thank you NOI for the tools……..our voices and our being are considerably more effective than any other modality we roll out…..
Hello David, lots of saltires flying here given the politics of the voting later this year . As ever the headlines aren’t really that helpful . I think the report is referring to see a pain psychologist in particular . Resources in this area have always been poor. The time frames according to the health board stats displayed in the Falkirk Herald (seen a few minutes ago in Tesco whilst waiting for the reduced trolley to roll by) to see a ‘pain’ Dr or physiotherapist are much less….However , practically there are lots of well qualified and interested people who do have an awareness of the literature and are able to deal with pain related to trauma , neuropathic and central mechanisms etc etc . Ongoing pain sensitisation which requires a MD input and team working is not served that well ‘here’ …..There are huge issues to do with pain /suffering/distress and often the biggest need comes from areas with deprivation . There are areas in Scotland which have extremely poor levels of health –some of the worst in western europe . Pain clinics tend to have extremely complex caseloads as you know . Much of the suffering that I have experienced when working in the clinic will not respond particularly well to better educated staff or more medical resources…often different things are needed …. Thanks for your reply Ian – there is a lot in it as usual. The Scottish story is not unique of course. We know in Australia that in the group of 45 to 65 years old unable to work due to pain, that 45% live in poverty and have accumulated approximately 85% less in savings than those with no chronic health problems and able to work til age 65 (painaustralia 2013 annual review). Maybe government does not want to know pain as a health problem? Yet the tragedy is that those in power do not seem to realise that if the public has a bit more knowledge about pain then the lift in the mental capacity of society could be a resource that can be extrapolated to a lot of health issues. If the Glaswegian lefties can’t do it, I don’t know who can! “Biopsychosocial” – the term came from a Scot (Gordon Waddell) – most of my colleague forget the social part – the problems that the patient in front of you has are often a problem in society as a whole, in this case, pain literacy. Thanks for highlighting the plight of those suffering with chronic pain and disability in Scotland. As Ian says the 110 week wait is for Psychology in one area of Scotland and does not reflect the overall situation or specifically Physiotherapy. There are many Physiotherapists in Scotland who have pain expertise and they don’t just work in musculoskeletal or specialist pain services – but also respiratory, care of the elderly, neurology, paediatrics not to mention my colleagues in the private sector. What is for sure is that there are great efforts being made to improve services for all. Physiotherapists here have been leading this and patients are being involved too. I know there are drives globally to improve the life of those with chronic pain and harnessing Physio’s to campaign for those who cannot should be a goal for us. I concur with the zeal and leadership of the Scottish physios from my last teaching trip there last year to Kilmarnock. I often think when I hear these sorts of stats that the physios are surely providing much of the psychology anyway though it may not be ideal for all patients. There is another issue which is never addressed and that is that it may not be health based psychology but educational based psychology which may be more apt especially given the remoteness of some parts of Scotland (and Australia).